In this series, the swimmer is well streamlined with the hips trailing in the shadow of the large-volumed torso. Frame #1: The right arm is extended fully forward as the left arm is finishing its propulsive phase. The head is well down in the water. This "stretched" position is similar to that displayed by Rebecca Adlington. The right leg is positioned to kick to counterbalance the exiting left arm. Frame #2: The right arm begins to be repositioned to apply propulsive force. It is posited that the left arm is about to leave the water at this stage. The head remains low in the water. The right leg kicks and the left leg is positioned to kick. Frame #3: The right arm continues to be repositioned. The elbow remains high because of medial rotation of the upper arm and outward rotation of the lower angle of the right scapula [which can be seen by the emergence of the scapula in line with the upper arm]. Abduction of the upper right arm begins. The right foot is pointed down creating a drag force that has a considerable vertical force component as it still counterbalances the left arm recovery and also assists in turning the hips/body. While that occurs, the left leg begins to be raised prior to kicking to counterbalance the increasing vertical forces created by the right arm's repositioning. Frame #4: The right arm continues to abduct. However, the well-advanced recovering left arm has caused the shoulders to flatten somewhat causing the abduction to rely more on the internal rotator muscles of the shoulder than the external rotators [it would be preferable to have both sets of muscles working in balance]. The right arm also bends further at the elbow while the wrist flattens from the partly flexed position shown in the earlier frames. The left leg completes its kick and the foot points down creating a considerable drag force. The head appears to begin rotating forward. Frame #5: The right arm has passed the end of abduction and continues into adduction. From this perspective it seems that the elbow has moved faster than the hand, which suggests less than maximal force production. However, using the lane floats as a reference point, the movement of the hand and arm seem to indicate the major force component is horizontal which is desirable. The right leg rises preparatory to kicking as the left arm approaches a long forward entry. The head continues rotating forward. Frame #6: The right arm continues to propel the swimmer forward. Although adduction is completed, the hand-forearm surface is still developing force backward. From this point on, the right arm's ability to produce effective force diminishes. The left arm has entered and the right leg has kicked to counterbalance its vertical force component. The head has rotated and risen to the point where the swimmer's cap is no longer underwater. Frame #7: The right arm "rounds-out" as the initial part of its exit. The left arm remains extended forward and could be starting to press downward. The right leg remains deep from the kick and its foot displays minor dorsi flexion. The left leg is positioned to kick. This frame signals the commencement of a period of inertial lag, as no obvious propulsive forces occur. Frame #8: The left arm remains extended forward. The right arm has exited and the left leg kicks to counterbalance its vertical force component. As the arm recovers the head sinks lower in the water and most of the cap becomes visible again. The inertial lag continues. Frame #9: The left arm continues in an extended position but shows hints of preparation to produce increased forces. The left leg completes its kick once more with the foot finishing in a resistance-producing slightly dorsi-flexed position. The recovering arm is now high which likely pushes the head lower into the water. Almost the entire cap is visible while the swimmer's gaze is forward. The right leg prepares to kick and its foot has broken the water-surface level. Frame #10: The left arm presses down and bends at the elbow and wrist. The right leg kicks to counterbalance the increasing vertical force component of the left arm action. The left leg rises. The recovering right arm is forward of the head. The swimmer still gazes forward. Frame #11: The right arm is repositioned to begin applying propulsive forces. Adduction of the upper arm seems to have just begun. However, the trailing drag resistance off the right hand and forearm shows that negligible propulsion is occurring. The right arm has entered. This frame marks the end of the inertial lag which existed for approximately four tenths of a second. The left leg prepares to kick. The right leg remains angled downward continuing to counterbalance the vertical force components created by the left arm action. Frame #12: The left leg kicks to counterbalance the rolling of the right shoulder and extension forward of the right arm. The change in the position of the trailing drag pocket off the left arm suggests that propulsive forces are being created. Considerable abduction of the upper left arm occurs. Frame #13: The left upper arm passes through the end of abduction. Extensive forces with the left arm propel the swimmer forward. The right leg again has risen sufficiently high to have the foot break through the water-surface level. The left leg drags and probably assists the body to roll to the right (along with some minor force components off the propelling left arm). Frame #14: Propulsion continues off the left hand-forearm surface as the upper arm completes adduction. The right leg kicks to counterbalance a vertical force component off the latter part of the left arm pull. The left leg has risen. The head is now well down in the water approaching the position displayed in Frame #1. 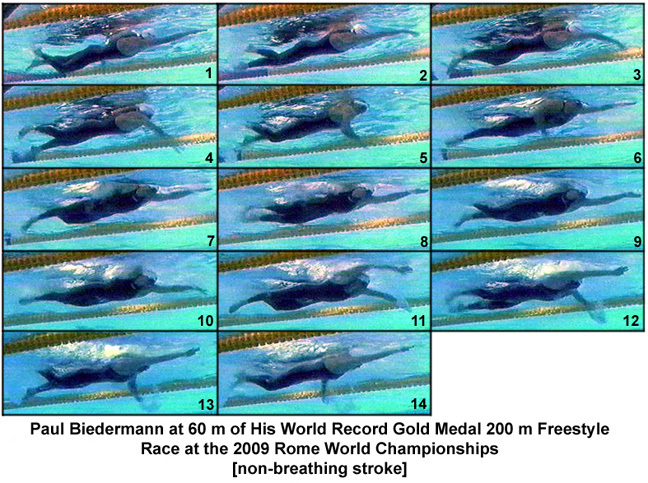 The technique of this swimmer does not display a high degree of exemplary execution. The long inertial lag that occurs before the left arm-pull is one area that could be improved. While an inertial lag persists, the swimmer will slow markedly (Newton's First Law). The change-over from the left arm propulsion to right arm propulsion is much more admirable than the change from the right to left. The rotation forward and lifting of the head, as well as looking forward, is an undesirable action. The head should have remained deep in the water throughout the total stroke since no breathing occurred. When not breathing, only movements in alignment with the spine (the longitudinal axis) are necessary. Paul Biedermann appears to be a big man with a large torso. His streamlining utilizes that characteristic with the hips always in the torso's "shadow". The kicking action clearly shows positions of the feet that create resistance. No frame shows either foot in any position where any appreciable propulsive force could be created even for the briefest of moments. The leg actions here serve to keep the swimmer streamlined by counterbalancing entering and exiting arms as well as assisting in hip rotation.